Part of the fun I think of art, at least for many artists, is the ability to experiment, to just try something and see what happens. I'm not sure how this would translate to artists who paint or draw in great detail but my guess is that they too experiment in their own way. 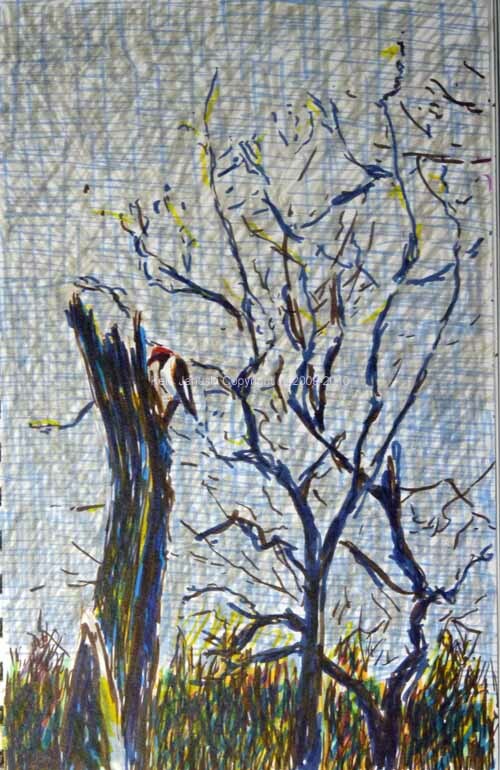 In any case my recent drawings with Faber-Castell 'Pitt Artist Pen-Brushes' have been largely experiments. I just wanted to see what sort of image I would come up with using them. By definition almost the images would have to look different than my recent watercolors. I think that you can see in these examples that each subject had me using the pen-brushes somewhat differently. The subjects are: Black Skimmers, Laughing Gulls and Forsters Terns at top, Tree Swallows in middle, and Yellow-rumped Warblers with Beech tree that was just leafing out at bottom. For a couple of years now we've seen Willow Flycatchers at the wetlands at Morris Arboretum. But we've always noticed them in late summer or early fall. So we've never known if they nest there or not. Today I got a clue when I found one singing there. That's no guarantee it will breed. 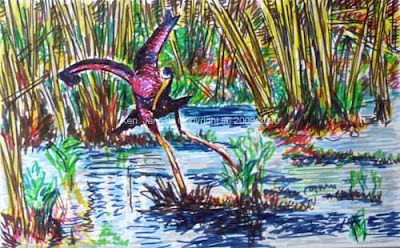 But it is starting to get late for migrants and the wetlands SEEMS like good breeding habitat. We can always find them at Tinicum(John Heinz National Wildlife Refuge) in Philadelphia in the summer. But it would be nice to know they're also almost next door, at Morris Arboretum. 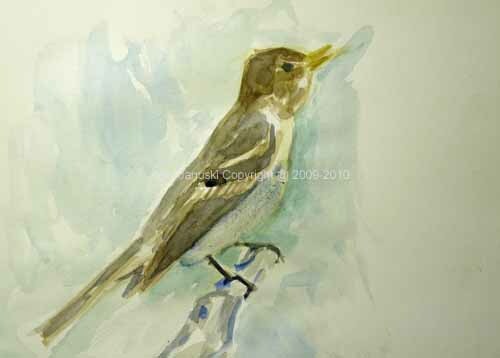 Over on the wildlife art thread of birdforum.net someone suggested a new thread on 15 minute bird paintings. That was my intent with the one of the Willow Flycatcher here. 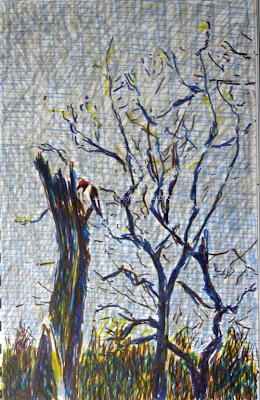 It's based on a field sketch I did today, also above, as well as some photos I took. Due to the drab nature of these birds they are a bit difficult to deal with. But nothing ventured nothing gained. 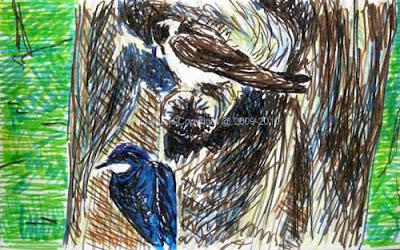 I also tried both in the field sketch and in the painting to portray the bird singing. 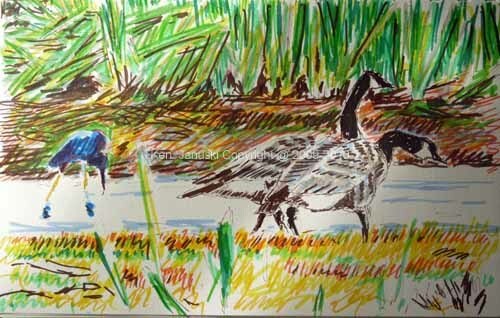 As you can see in the field sketch I just didn't get it right. 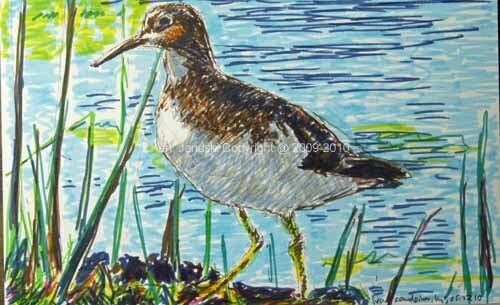 In the watercolor I had the luxury of looking at a photo I took so it may be a bit closer to that open-billed, head-thrust-back, chest-puffed-out pose that many passerines take when they sing. 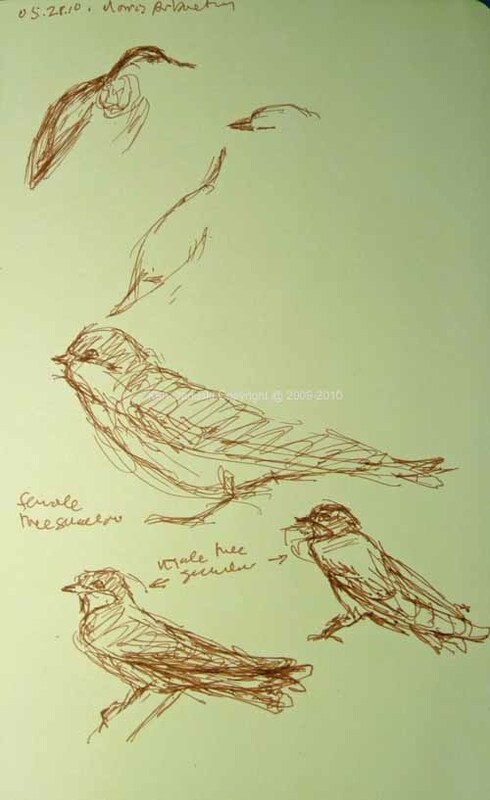 Also included are some field sketches of Tree Swallows which were kind enough to stay in the same position and give me a decent chance at getting them down on paper today. 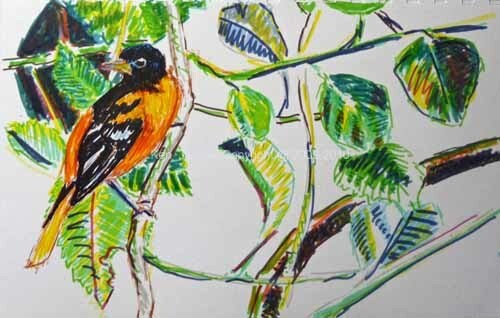 Twice in the last week I've learned something new about the Baltimore Oriole songs that I find so captivating. 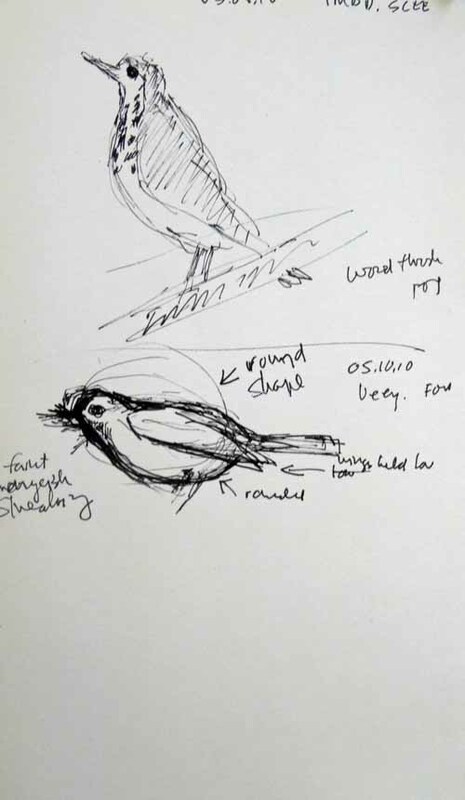 Laura Erickson, outgoing editor of 'Birdscope' from Cornell Lab of Ornithology says in this issues 'From the Editor' that she learned her local Baltimore Orioles song while living in Madison, WI and then could tell each spring which orioles were local and which were migrant. I thought of this when reading Mel White's article 'Note Imperfect' in the newest issue of 'Living Bird', also from Cornell. In it he commits the sacrilege of saying: "I like my description of a Baltimore Oriole's song as sounding like a tone-deaf person trying to whistle a generic bird song better than, say, 'rich, piping whistled tones.'" Unless that is some of us are lucky enough to have local Baltimore Orioles that know how to sing and others, like Mel White, aren't so lucky. This is not to pick on Mel White. I've always enjoyed his writing. I just can't understand his take on Baltimore Oriole songs. But the fact that their songs do vary by locale makes me think that maybe they're just underachieving songsters in his part of the country. 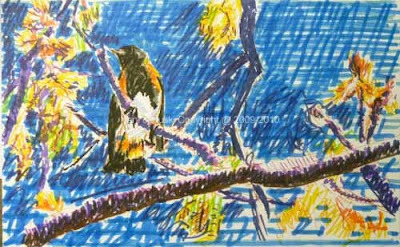 Another Baltimore Oriole disappointment has been my artistic representation of them. I've published three in previous posts. The last, done in felt-tip pen, seemed the best to me. At least in gave some feeling of the richness in color and song of the Baltimore Oriole. But it was more or less a scribble. Finally, at top, I have one that I like. 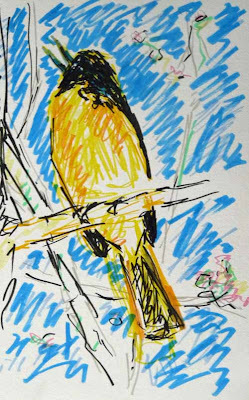 This also is in felt-tip pen, but I think combines realism and abstraction in such a way to portray a Baltimore Oriole as I see and experience them. I'm sure everyone has heard of writers block, where an author just can't get started writing. The same thing happens with artists. You just can't get started drawing, painting, sculpting. But what do you call it when you can't stop drawing and painting? Ever since I picked up the Faber-Castell 'Pitt Artist Pen-Brushes' about a week ago I can't stop. Drawings keep pouring out. I think part of this is that I really can't work long on them. They are small, 6x9 inches, and they won't take that much work without becoming just dark blobs. The other thing I think is that I find myself very comfortable with them, even though I've already run into some of their limitations. Oddly enough I hated these when I first bought them 3-4 years ago. The point of the marker was just too broad for my comfort. Who knows why I like them now? But that is the nature of life I think. Our tastes change. We'd all be happier if we admitted it instead of thinking that we needed to hold the same view on something throughout our life. In any case above are two Least Sandpipers and three Glossy Ibises, one with two Canada Geese dominating the picture. All were seen on our trip to the Cape May, NJ area a couple of weeks ago. Recent rain has forced me to stop going out in search of birds and continue playing with my new toys, the Faber-Castell Pitt Artists Pens/Brushes. This isn't a plug for them, though it may seem like it. I just feel like I ought to tell readers what tools I'm using. Fooling around a bit more with the felt-tip pens. 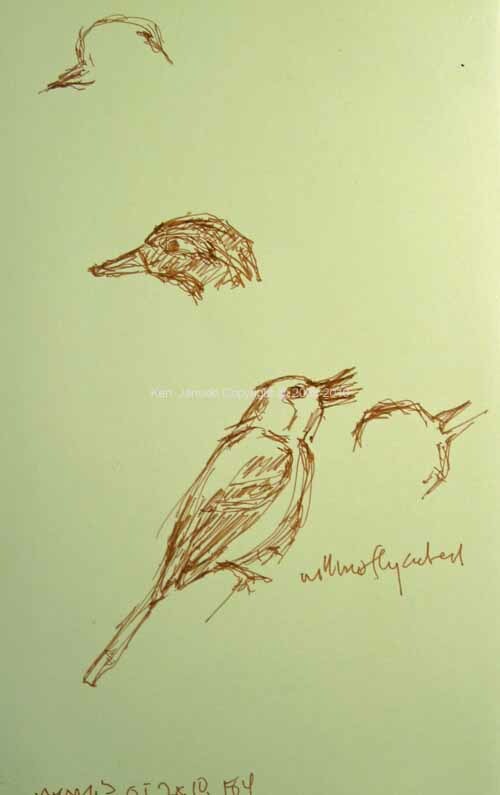 These two are based on photos that I took, one an Ovenbird at Shenandoah National Park and the other a Red-headed Woodpecker seen at Lake Le-Aqua-Na State Park in Illinois. For various reasons I didn't think I could do much with them, much as I like both bird species. But these felt-tip pens almost force you to work loosely because the tips are just too broad to allow detail, at least at the small size I'm using. So both photos seemed like they might be possible to work from. At least it was worth a try. The nice thing about a new medium is that you can play with it in numerous ways. I'm sure I'll be doing some more in the coming days and weeks. Sometimes you just feel like stretching out and trying something new. For some reason my Faber-Castell 'Pitt Artist Pen-Brushes' have been calling to me recently. The siren song of a felt-tip pen! Who knows why. I bought them at least three years ago and never liked them because the point seemed too large and flexible, more like a brush than a pen. Maybe I just never noticed that they had 'brush' in their official name. In any case I enjoyed fooling around with them in the Baltimore Oriole sketch yesterday. So I decided to try something a bit more developed today. This is based on a photo I took a year ago at Heislerville WMA in New Jersey. 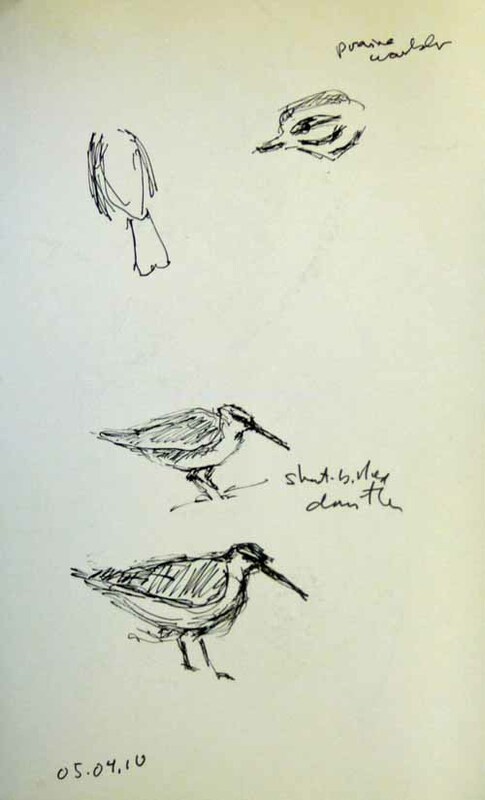 It caught a gull, probably Ring-billed, a sandpiper, probably Semipalmated and a Dunlin in flight or just landing. I've always liked it but working from photos, especially for birds in flight always seems like cheating. No human could ever see this scene. Only a camera could capture it stop-action like that. But since I was throwing caution to the winds today by using the brush-pens it seemed fitting to go ahead and break some other rules. At least my rule-breaking doesn't lead to an economic meltdown. I'm not a multimedia type of guy. I'm not wired for all eventualities. I don't carry an electronic laboratory with me when I walk out the door. But if anything could convince me to change my ways it would be the arrival of orioles in spring. The reason for this is that Baltimore Orioles, and to a lesser extent Orchard Orioles, are truly a multimedia experience. You might think that the wood warblers would be. They are a riot of color. But they don't sing. They don't warble. They have high pitched twitters, with some rare full-throated exceptions. 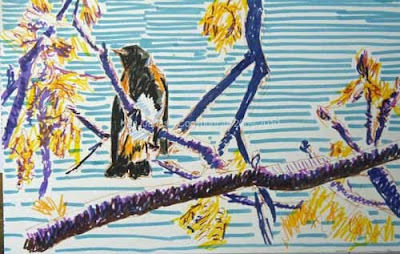 But the Baltimore Oriole does sing, fully and melodically. Their color really can't be beat for bold, warm striking color. The right antidote to winter. But then you hear their song and you think I've just got to capture this. Orioles aren't complete without their song. I remember a few warbler weekends at Pocono Environmental Education Center that coincided with the arrival of multiple Baltimore Orioles. 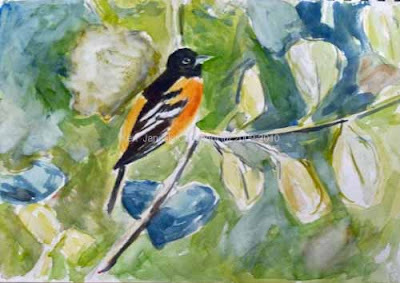 The entire campus was an Oriole orchestra, richly singing in spring. For all that though I'm not about to become a Multimedia Type of Guy. Like artists of the past all my emotional reactions to orioles are going to have to be wrapped up and expressed in traditional media. This was made particularly noticeable to me yesterday when I found this gold and black oriole at Morris Arboretum, singing away high in the sycamores. I was thrown both by its beauty and by the difficulty of identification. The song was what I'd always considered that of a Baltimore Oriole. But the bright yellow of the bird was more that of an immature or female Orchard Oriole. I was thrown. If it was an Orchard why was it singing like a Baltimore. I don't see Orchards all that frequently but I recalled that the immature males had black somewhere on their head. We've seen them many times before at Morris in spring. But where was the black on an immature Orchard? On the head? On the throat? I couldn't remember. Because I had my scope I could see such details as yellow under the black at the top of the head. That threw me even more but also struck me as something I had to get down on paper or canvas. When I finally got home I got out my field guide and decided that this had to be a female Baltimore Oriole. I also looked at some photos I took. In them the color was more yellow-orange as I'd expect in a female Baltimore Oriole and less golden yellow than it had seemed in the scope. Well at least that explained the mystery of the Baltimore Oriole song. 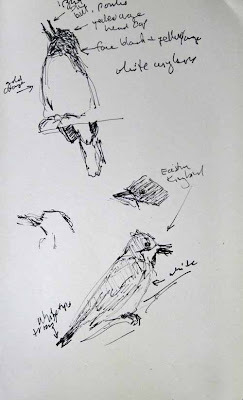 I include above a field sketch of the singing bird as well as a couple of a calling Eastern Kingbird. And a new attempt at capturing the experience of a Baltimore Oriole in spring, full of color and song. This is a quick sketch with felt-tip pens based on my field sketch and photos. I did it this way because I wanted boldness. Baltimore Orioles are bold! There is a tradition it seems in bird art of doing sedate, quiet views of birds in pastel-like watercolors, with everything toned down into a pleasant harmony. This makes for harmonious paintings. But it doesn't accurately reflect the experience of a Baltimore Oriole. The ability to express an artists reaction to an experience, bird or otherwise, is I think what will always differentiate it from photography. There is so much room to do more than just capture the appearance of the bird. There is so much room to capture the experience of the bird. I can't say that this fully does that. But I wanted to give it a try. I think it's a step in the right direction. As regular readers know I've been trying to accurately portray Baltimore Orioles for the last 10 days or so. This is one more attempt. I'm sure that there will be more. While I keep working on this goal my advice is: get out and see your own while they're still around. 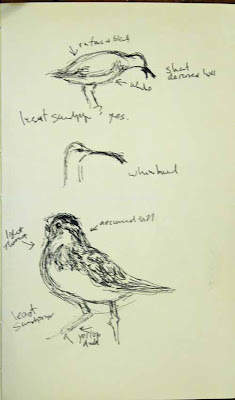 I never finished putting up the fieldsketches from our recent trip to Cape May. After the first batch I got distracted with new works and new birds seen in Philadelphia. So here's the remaining group. 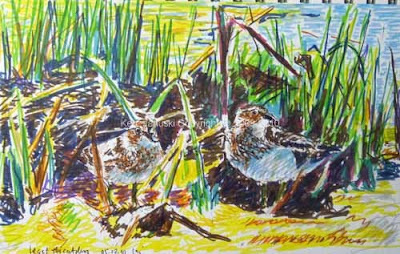 The sketch above is of a group of Short-billed dowitchers trying to find places to perch on a small fallen tree at Heislerville WMA near Cape May, NJ. 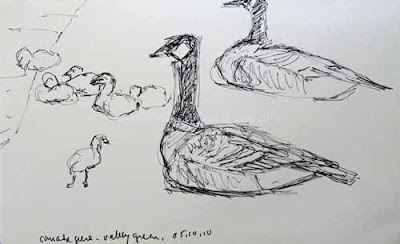 I think part of the fun of fieldsketching is capturing real life moments like these. Following up on the shorebird theme the two drawings above include another Oystercatcher as well as a Green Heron, and a page of Black-bellied Plovers along with a Semi-palmated Sandpiper, and a Laughing Gull. We did go to Reed's Beach by the way to see if any Red Knots had arrived yet. Nope, just hundreds of these raucous Laughing Gulls. Our single Red Knot was seen at Heislerville. 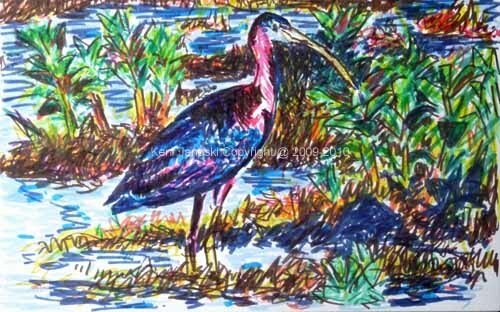 Next we have Glossy Ibises. They were everywhere. In the sky they just look like dark birds. Up close as many of these were they are wonders of iridescent colors, somewhat like the green and maroon of Green Herons, but toned down about 6 notches, to where they are very dark. 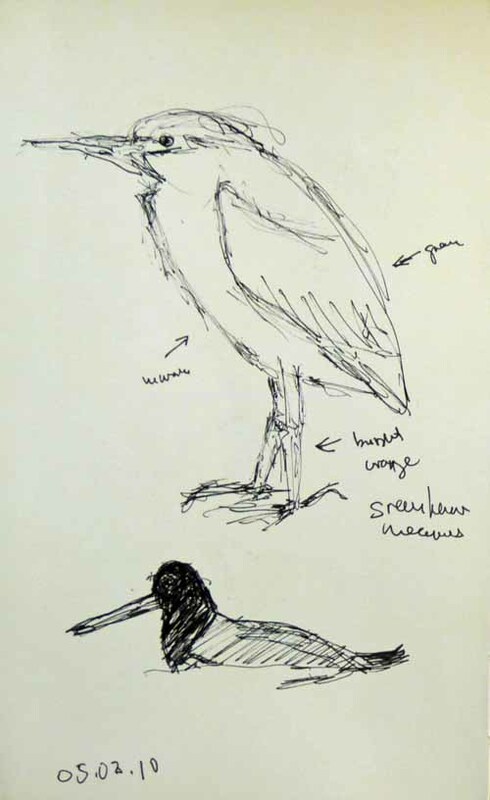 The top drawing shows a Glossy Ibis in an awkward but striking pose preening itself. Above it is an Eastern Willet. 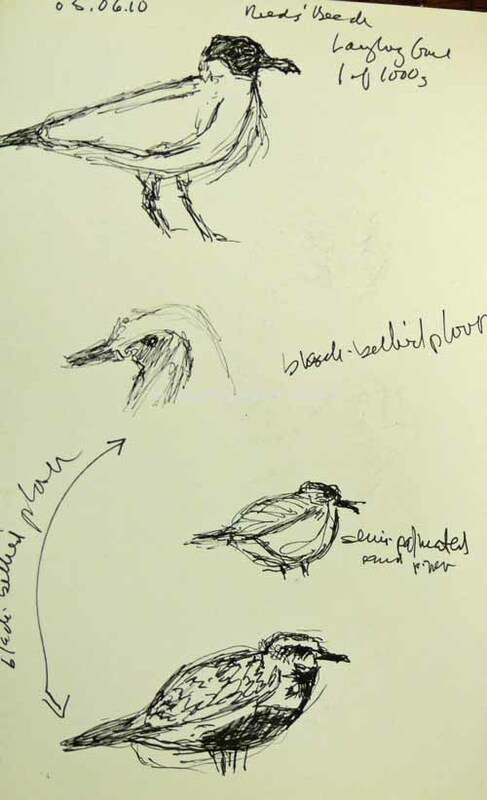 The middle drawing includes another ibis as well as many Purple Martins at the house at Cape May Point State Park and a Piping Plover on nest. 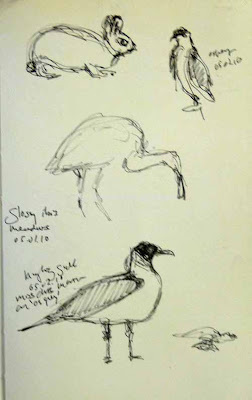 The bottom drawing includes one more ibis as well as another Laughing Gull, rabbit and Osprey. 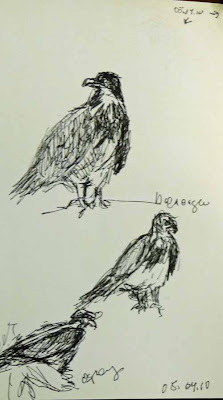 Finally two drawings of an immature Bald Eagle seen at Heislerville and one almost indecipherable Osprey, most likely also seen there. Finally I should say that these are all done with a Faber-Castel 'Pitt Artist Pen.' I've had these pens for a long time but only recently started using them for fieldsketches. I think the fact that you have to live with what you put down and not worry about erasing makes for both more sketches and more spontaneous sketches. Pocono Environmental Education Center that we first saw the video 'Watching Warblers' by Michael Male and Judy Fieth. At that time PEEC's workshops started on Friday night and ended on Sunday afternoon. It was always thrilling to watch the main Friday night presentation, a teaser for what was ahead. These presentations were almost always successful and made you eager to get out early the next morning and see the birds. But one time this video was also played. That was enough to nearly give you a heart attack - just too much excitement! 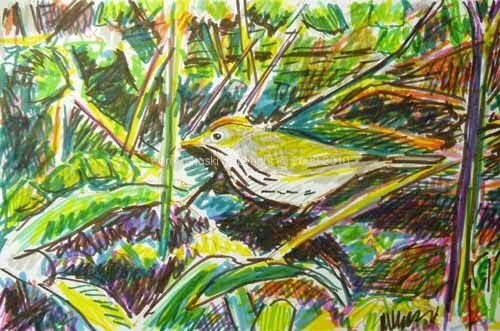 All of the colorful eastern wood warblers on one video, mainly in breeding habitat, and often singing their songs. What more could you ask for? Well outside of seeing the birds themselves I mean. May is the month of warbler migration in Philadelphia. A few have arrived but nowhere near as many as you'd expect by now. But barring some sort of horrific fallout from the Gulf oil spill, which is always possible, they should be here soon in greater numbers. Just today I saw a couple of Canada, Black and White and Common Yellowthroat warblers. And Ovenbirds were singing away though I didn't see them. 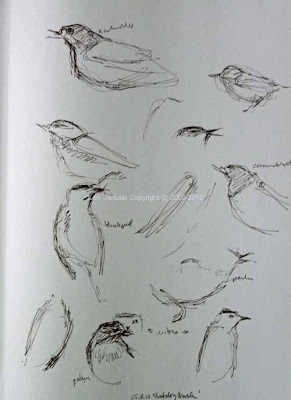 It's generally difficult to even see warblers let alone draw them. This year will be worse than usual because the trees are already fully leafed out. 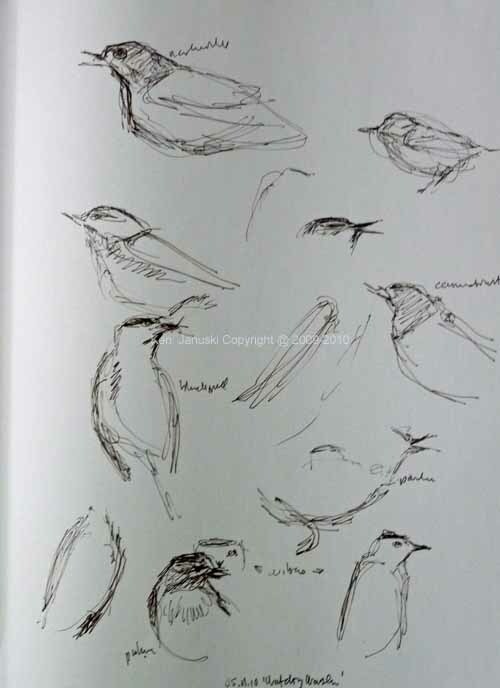 We may easily hear warblers but seeing them will be hard. And yet this is the only chance I'll have to draw them in their breeding plumage. If you can barely see them how in the world can you draw them? Another birder asked me this very question last week in Cape May as we searched Higbee Beach for warblers. Well I've never been successful at it. But I hope to change that this year. I did at least get the head of a Prairie Warbler last week at Cape May. One problem, outside of being distracted by their beautiful colors and patterns, is that I just don't really grasp their basic shape. I can never figure out how the head fits with the torso, and where the wings fit on the torso. 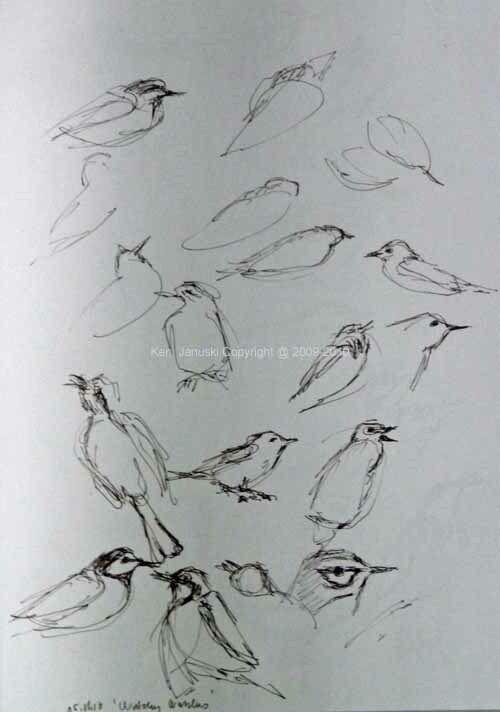 So this afternoon I played 'Watching Warblers' and sketched as it played. Though I could have stopped the DVD and had an easier time drawing I didn't do so. When I'm out in the field the birds aren't going to stop and pose for me. They're busy hunting for food. So the best way to get ready for drawing them was to just draw as the tape played. You see the results. I like them, even though they're meant to be an exercise, not finished drawings. I think that they've accomplished that somewhat. We'll see what happens now when the warblers finally arrive. 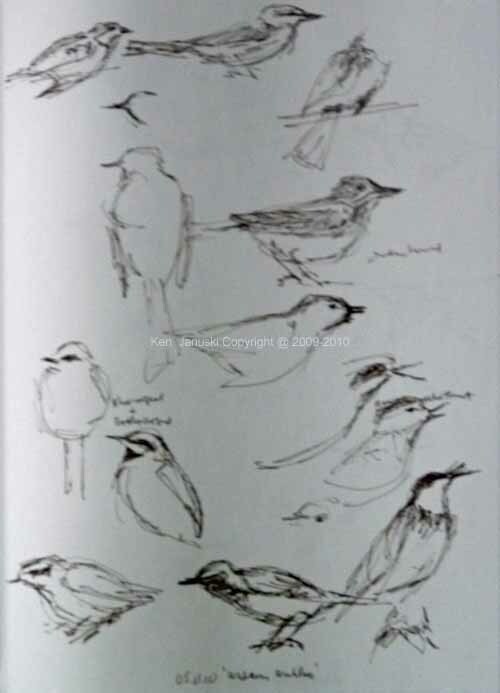 Even if you have no interest in drawing birds I'd really recommend this DVD. 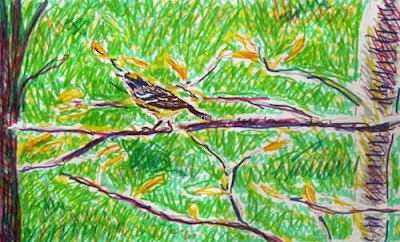 If you have any interest in wood warblers I think you'll enjoy it. And if you have no interest in wood warblers, well you are missing one of the wonders of the natural world. Enjoy them while you can. It's very hard to stay inside in May with bird migration in full swing. So I spent 4 hours outside today even though the temperature probably never broke 60. Again the Baltimore Orioles were singing away, this time at the Wissahickon. 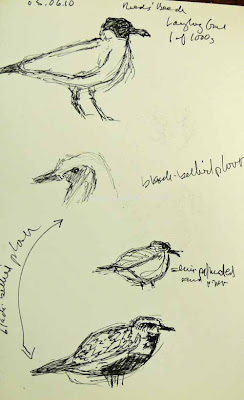 Wood Thrushes and Veeries were also plentiful and I include a sketch of them. For some reason I just couldn't get the very round shape of the Veery down correctly. I also came upon some Canada Geese and their goslings and settled down on a park bench to sketch them. I knew they'd be nervous because of the young. But I was proceeding along fine, just feet from them, when someone came up and took photos. That moved them all from their original positions and made the sketch a bit more difficult. The air was alive with Northern Rough-winged Swallows so I finally took the opportunity to sketch one of them. As I left I couldn't resist trying the horse in the corral next to where my car was parked - I realize this is an unusual statement coming from a city as large as Philadelphia. 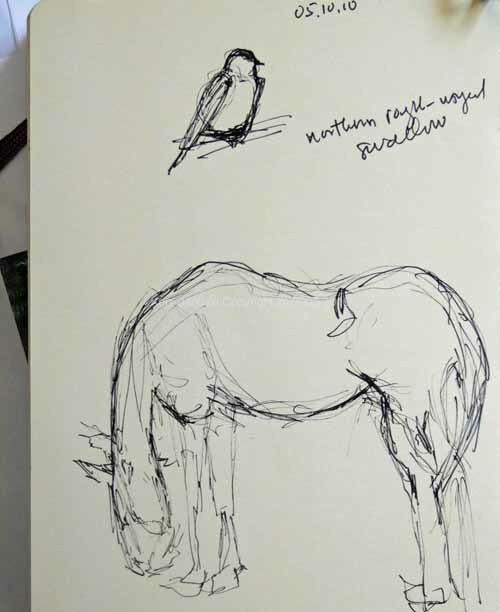 But it's true I parked next to a corral with two horses to do my birding about a mile from our house. And finally back to that beautiful Baltimore Oriole. This is based on the same photo as yesterday's failed attempt. I like this somewhat better. But the background is a mess. 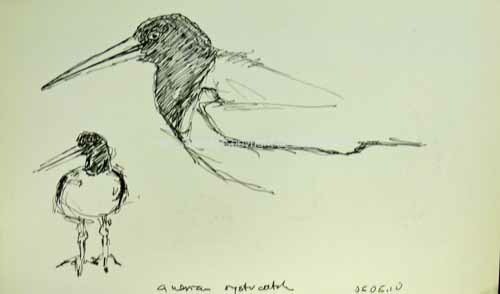 But I don't think I'm going to get a good Baltimore Oriole without numerous failed attempts. This is number two. They are such beautiful birds, both in song and appearance, that you just can't help but want to get them right. 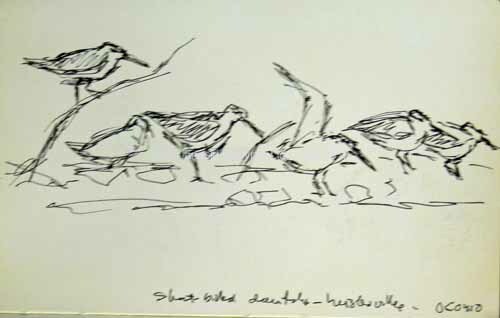 If we're in Philadelphia in early May we often take part in a bird count, one focused on migratory birds. It is the beginning of peak migration. At first I think this was called International Migratory Bird Day. Now it may just be part of a Pennsylvania count. I've never really investigated the details. Yesterday's count was difficult. Rain and thunderstorms were predicted, though they never appeared. Trees have leafed out earlier than normal so it's hard to see birds even when you hear them. And, it was extraordinarily windy, something birds really don't like. They hunker down out of sight in it. So our counts at both Schuylkill Center for Environmental Education and along the Manayunk Canal and Schuylkill River were a bit low. Nonetheless the Baltimore(now officially 'Northern') Orioles were newly arrived and singing away. Their songs are so rich and unique that you always know when they're around. We also saw, or heard, a good number of Wood Thrushes and Veeries, birds which we didn't see until yesterday. My first bird of the day at SCEE was a Wood Thrush, singing away about 10 feet in the air right in front of me. I took advantage of this to do a quick field sketch. It was quick though because I had a lot of ground to cover. I'm not showing the thrush drawing since it's not particularly striking. 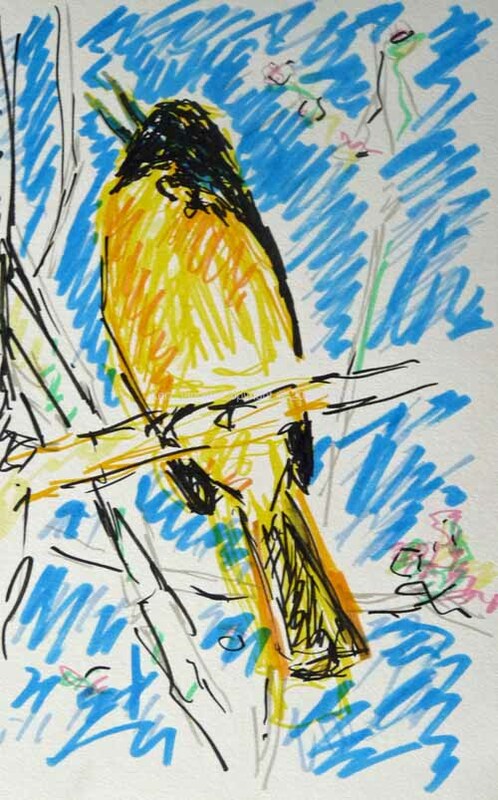 Instead I'm showing this Baltimore Oriole based on a photo I took yesterday. 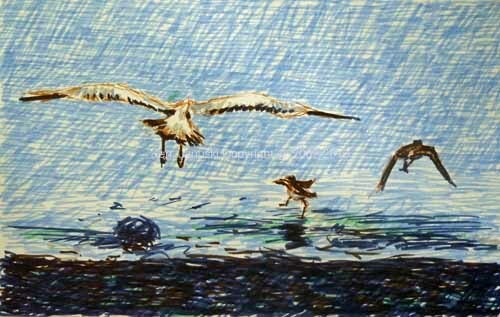 It took about 15-30 minutes for a preliminary sketch and another 30-60 minutes to paint. It turned out pretty much as I expected: very disappointing. This bird of brilliant colors and contrasts seems like the perfect subject for a painting. And like it's counterpart in red, the Scarlet Tanager, it seems impossible to paint. 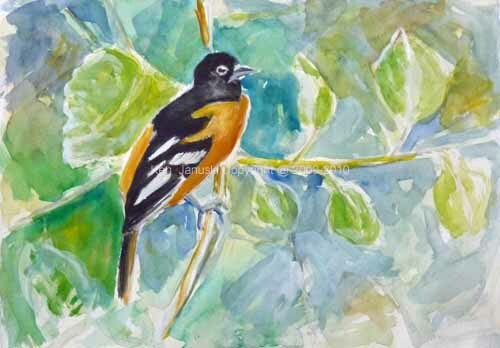 The brilliance of a real oriole or tanager seems to disappear and turn to mud in a painting. I've avoided painting Scarlet Tanagers for years because of such problems. But I got good photos yesterday and a painting of a Baltimore Oriole seemed like such a fitting tribute to many of the coloristically brilliant neo-tropical migrants that appear in May. I'm disappointed in the results but not sorry I tried. I'll keep working at it and eventually get a painting I like. This migrant and all the neo-tropical migrants deserve no less. They are threatened from all directions, including by the people who I'd put in the lowest rung of hell, developers. Perhaps if people could see what truly striking creatures they are they might have more interest in saving them and not be so cavalier in destroying their environment. About six months ago I published a post called 'Sketching the Natural Wealth of Cape May.' 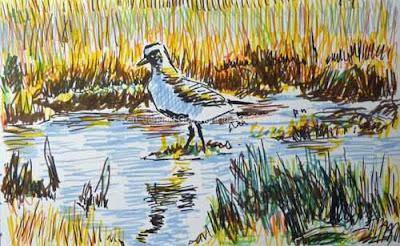 It was a celebration of both the bird diversity of the Cape May, NJ area and of the value and excitement of fieldsketching. Well it's time for part two of a probably recurring theme. We spent the last week in the Cape May area, seeing over 100 species while we were there. They include shorebirds, warblers, raptors and others. 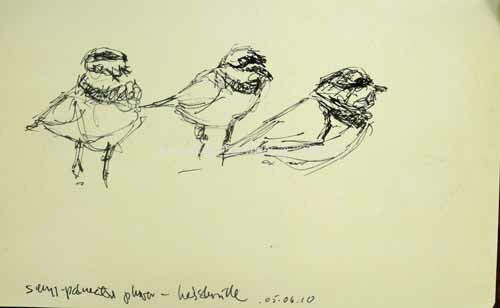 The sketch above was based on tens and tens of Semi-palmated Plovers sitting before us at Heislerville WMA. Though a single bird might have been more artistically successful there were many birds and I wanted to show that. We also saw many Short-billed Dowitchers, both at Heislerville and elsewhere. They're at the bottom of the page above. 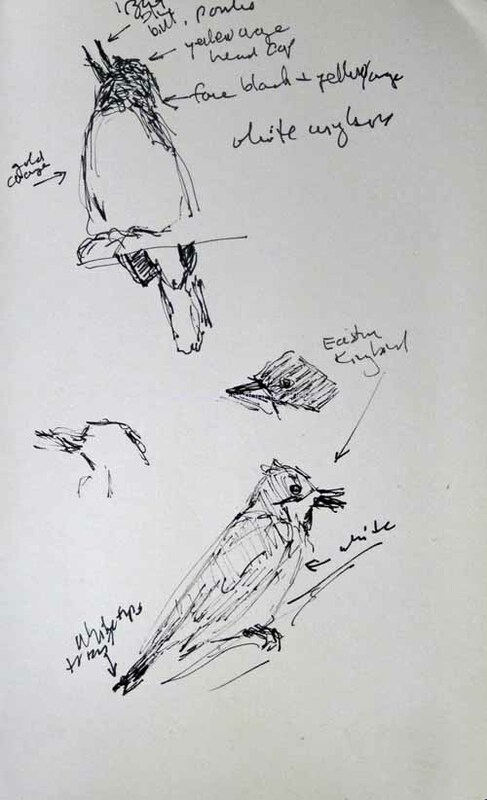 At top right is a brief sketch of a Prairie Warbler. The wood warblers are among the most beautiful birds that visit or breed in the U.S. so we always love to see them. But they flit actively about constantly in search of food. Though this was probably the most good looks at a Prairie Warbler that I've ever had this still was the best I could come up with. So as you can see there is still a lot of room for improvement. Many people know how hard it is to even see wood warblers, let alone photograph them. I think most people who know this, as one person said who was watching me try to sketch them, realize that actually sketching them is like some sort of extreme art sport. But it's not just a sport. It's an interaction with a living creature. You can't fake it. Either it works or it doesn't but often the thrill of even trying shows in the drawing. There is a movement in food called 'Slow Food', and I've heard of such things as 'Slow Art.' I haven't actively investigated their meaning but I think that they are a reaction to a non-stop world and a realization of the pleasure that is lost in not taking time to enjoy things, whether food, art or something else. The same can be said of birding. We're slow birders. So we don't get alerts on our cell phones about the newest rare bird 25 miles away. But we do almost always end up with memorable experiences with certain birds, and perhaps other animals, on our vacations. Last year it was the Piping Plovers at Cape May. This year among other things it was American Oystercatchers. 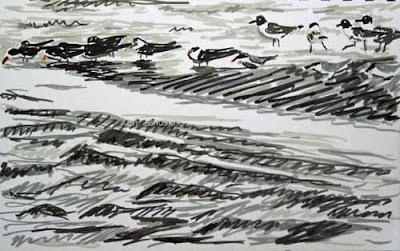 For three or four days they were at the same place at 'The Meadows' and allowed a very close approach. Above are two of the better drawings I did of them. 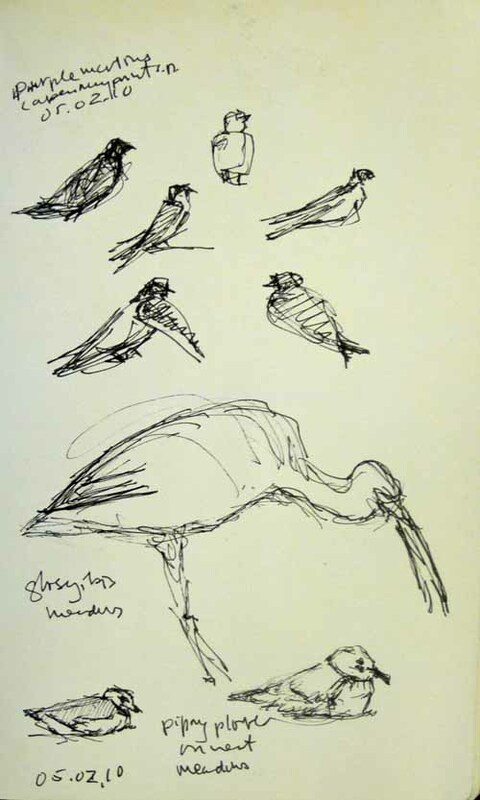 Another benefit of sketching the birds that you see is that you look at them more closely than you would if you were just trying to identify them or photograph them. I think the reason for this is that in IDing a bird you just need to see enough characteristics for your brain to decide on the ID. This is of course a complex and enjoyable process. It's part of the reason I think that many people love birding. 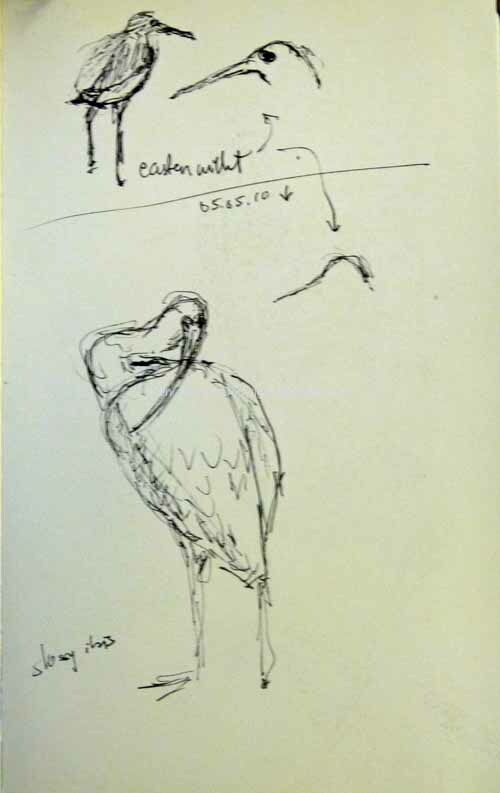 But to draw a bird you need to know more than just some charateristics, or field marks. You need an exact pattern so that you can copy the entire bird. Getting an exact pattern is almost impossible though. Almost no birds sit still for you. So you need to look extremely intensely trying to grasp the most important features so that you can get them down on paper. 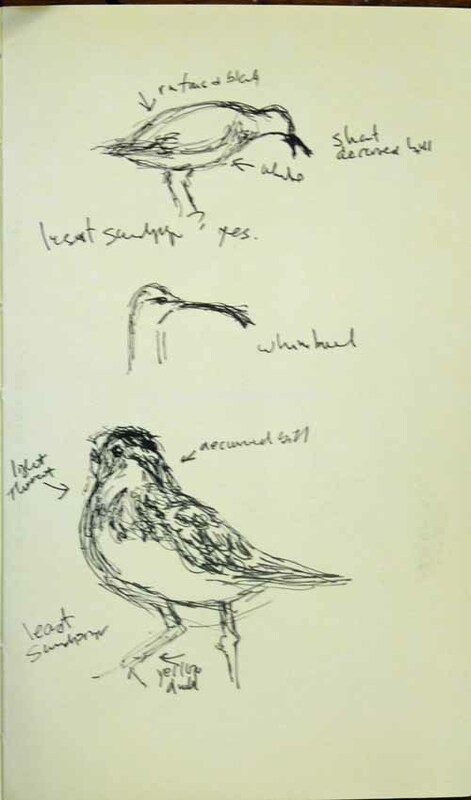 The top and bottom drawings are me trying to draw a Least Sandpiper and also making sure that is isn't the very similar Semi-palmated Sandpiper. One clue is a downcurved bill. That was obvious on the birds I saw and I was trying to capture it here. Unfortunately due to foreshortening it's not very legible on the bottom drawing on the page above. In between is a quick sketch of a Whimbrel. 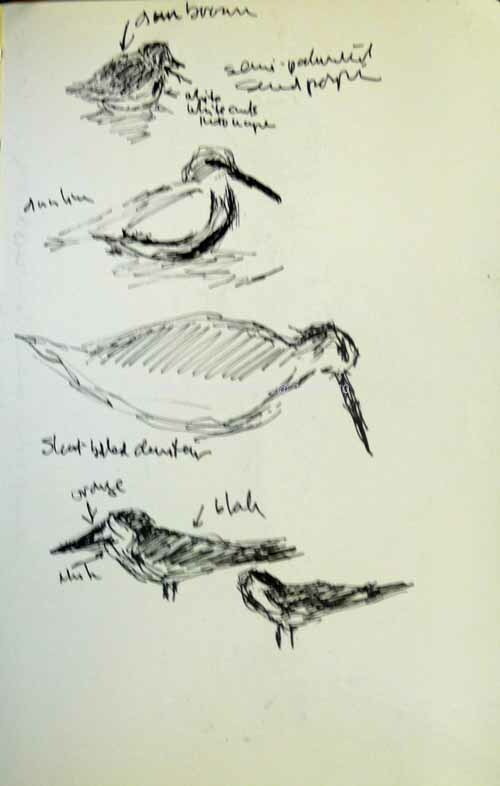 Along the same lines the last page above includes numerous shorebirds, starting off with the very small Semi-palmated Sandpiper and ending with the large Black Skimmers. The small size of the Semi-palmated was made all the more evident to us by some bird-banders at Heislerville. One researcher held the bird in his hand while he banded it and we saw how truly small the bird actually is. It was an amazing experience. 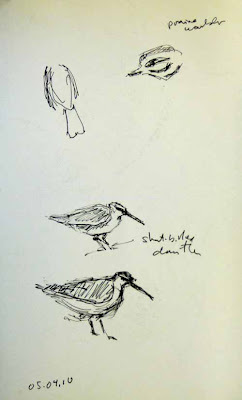 In between, going to larger and larger sizes are a Dunlin and another Short-billed Dowitcher. These are less than half of the drawings that I did. Over the next few days I'll show the rest.